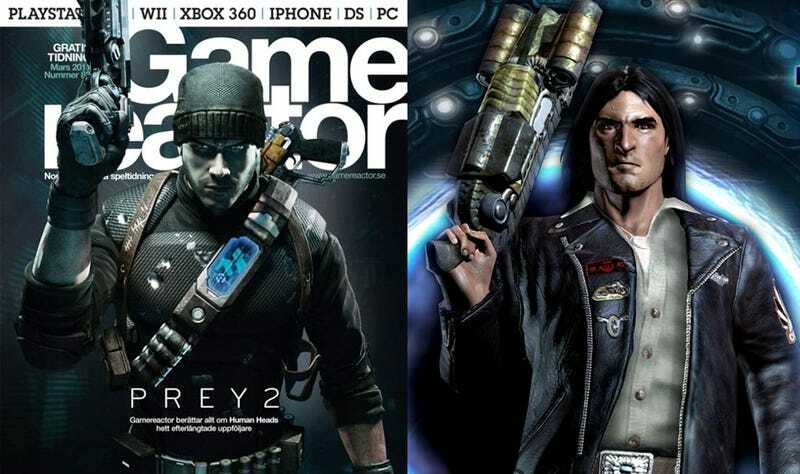 Prey 2 will be a very different sort of game than the original first-person shooter, which starred Cherokee Domasi "Tommy" Tawodi and explored some of the mythos of native american spirituality. In Prey 2, a source close to the game tells Kotaku, players will take on the role of a federal air marshal who is aboard the commercial airliner seen crashing in the spaceship early on in the original game. Prey 2 takes place during the same time frame as the original, but with this different perspective, we're told. In Prey, Tommy sees a commercial airliner crashing onto the surface of the space ship he is on and hears a pilot calling in a mayday for "Seajay Air 6401." Later in the game Tommy comes across a human survivor of the crash in a holding cell. 'We were flying over Topeka and then the lights, the lights, the lights everywhere. They took us off the plane... They.. .there's a big one.. It eats... it eats," the survivor tells Tommy before losing it and telling him to shut the cell door. Prey 2 follows the air marshal as he makes his way through the same ship, fighting off different warring alien factions with his pistol until an alien captures him. After that opening, used to tie the two games together, the game jumps forward, we're told, to a seedy alien planet that sounds a bit like the future Earth of Blade Runner. This is where the game really opens up, revealing the marshal as the only human on an alien planet working as a bounty hunter. The game is meant to be an open world title with multiple ways to complete objectives, but at its heart it is still a first-person shooter, we're told. Players will get clients via a communicator and gather information from the environment and the inhabitants by scanning non-player characters. These scans, we're told, reveal a character's intentions and identity. We don't know much more about the game, but we were told that one twist to the first-person shooter mechanic is the ability to grip ledges for cover and a heavy emphasis on platforming. Reached for comment today, Bethesda declined to comment.